Dave Dryden and Nigel Raincock have raised millions of dollars for charity. Each man does it in a completely different way but their fundraising has one key thing in common. Every cent you donate to their cause goes to good works. Dryden heads up Sleeping Children Around the World, a charity based in the Etobicoke home where Dave and brother Ken learned to skate and stop pucks on a backyard rink. The charity raises money to help individual children in developing countries with "bedkits" – simple collections of bedding, school supplies, sometimes mosquito nets or school uniforms. They just delivered their one millionth kit in the Philippines and are setting their sights on the next million. "We want this charity to go on forever," said Dryden. Last year, Sleeping Children raised $2.8 million. Since it began in 1970, founded by Dave and Ken's late father, Murray Dryden, they have raised $20 million. The charity could not be more grassroots. A $35 donation purchases a bedkit, using supplies from the home country. Volunteers assemble and distribute them at their own expense. That means the volunteer pays for airfare and accommodations in far-flung places like India, Honduras and Uganda. There is no fundraising expense. Amazingly, word of mouth has built this charity. Donors get a photo of their bedkit being delivered. Those letters and photos are assembled on the top floor of the two-storey Dryden home by women who have volunteered for decades. Any administrative expenses, like postage and the pay of the lone salaried employee is covered by an investment fund Murray Dryden left the charity. Every cent of each donation goes to the cause. This is a charity that could not be more low key. A plate of brownies or some breakfast treats arrives occasionally for the volunteers. The people who go on the delivery trips overseas are often retired teachers or principals. Charity rules stop them from claiming a tax receipt for expenses that are typically $5,000. At the other end of the spectrum is Set Sail for Hope, an annual fundraiser that mixes Toronto's business, culinary and yachting elite. Set Sail exists to support one charity, Camp Trillium – overnight and day camps that bring children with cancer and their families together. 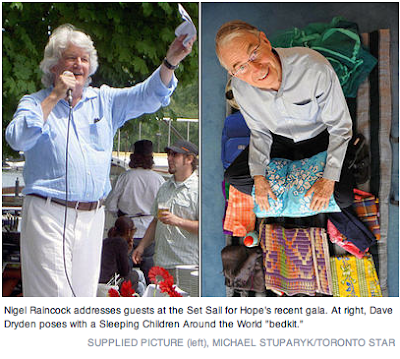 "Cancer doesn't take a holiday, it doesn't care about the economy," said Raincock, Set Sail's chair, in a rousing speech to those assembled at its annual gala on the Toronto Islands recently. On that Friday afternoon, 20 tables were set with white linen under spreading canopies. Chefs from some of Toronto's top restaurants, and their staff, donated time, food and considerable culinary expertise. Acqua Ristorante, Buca, Jacobs & Co. Steakhouse and Epic at the Fairmont Royal York were among them. There was beer and wine, oyster bars and, moored near the tables, 20 sleek yachts with names like Short Circuit, Kaisei and Sea Runner. Captains and crews donated time for a cruise after lunch. The price of admission per table/yacht is a $7,500 donation. It's mostly corporations like CIBC, Citibank Canada and Scotia Capital that donate, typically sending valued employees as a reward. They were short a table this year, and Raincock's daughter got a group of friends to kick in for the last table. Set Sail raises between $150,000 and $160,000 annually. This year was tough, but it met its target. "You have to kiss a lot of toads to get a princess," said Raincock, lauding the corporations who stuck by in a tough year. Since the fundraising effort started 23 years ago, albeit as a brown bag lunch with smaller boats, Set Sail has raised $1.9 million. Raincock's own boat, much smaller than the 44-foot yachts now used, just gets him over to the island. "This event has grown so big, she just doesn't fit in," he laughs. With all the food, equipment, staff and boats donated for the day, the only cost Set Sail has is a $25 event permit for selling alcohol. Somebody covered that. "Thank you for making a difference in so many kids' lives," said city Councillor Sandra Bussin, on hand to give the city's good wishes. "It's remarkable," said Fiona Fisher, Camp Trillium's development director, as she welcomed people to the event that has been a mainstay for the unique camps. Our 2010 calendar has arrived. The calendar for 2010 celebrates SCAW's 40th year but it's a fourteen-month calendar that starts with November, 2009. The 2010 calendar is sponsored by Lynette Jenkins and dedicated to her father, Charles Tudor Jenkins, Harold Charles Jarman, and all fathers everywhere. For each month, the calendar shows children who have received bedkits from Sleeping Children Around the World in the past years and celebrates our fortieth year. The entire $10 helps buy bedkits for needy children. If you don't need a tax receipt, why not buy some calendars. You'll have something to remind you about Sleeping Children all through the year, and you'll be providing bedkits for some deserving children. It makes a great gift for someone else too. Published on the Individuell Manniskohjalp website by Filip Nilsson, one of their volunteers. In case you can't read the original Swedish at the link above, Filip sent us an English translation. – The new beds are much better than the old ones, and the pillows are really soft, says Tsering Dolma when I ask her what she thinks of her new bedkit. She is a ninth grade student at the Munsel-Ling and is sitting outside the school with three of her friends. They are all very happy with each and one of them just receiving one of the 380 bedkits distributed at the school during the last couple of days. A few days after our arrival we meet three volunteers, Clarence, Laura and Milton from the Canadian organisation “Sleeping Children Around the World”, SCAW. They are visiting the school for a few hectic days when they are distributing 380 beds complete with mattresses, bed linen and pillows. While the kids were busy listening to the Dalai Lama the old beds were carried away and truckload after truckload arrived with new beds and accessories. – Earlier this year, in Kenya, we distributed our one millionth bedkit. Because of this are we now making a couple of extra celebratory journeys, not least this one to Spiti valley because our founder visited this area on one of his trips in the 1970’s, Clarence tells me. Almost everything we distribute is produced locally, preferably by smaller enterprises. That way we do away with unnecessary transportation and contribute to local business, he adds. Even though there are many beds and bedkits being put in place in a short time, this is a small project in comparison. 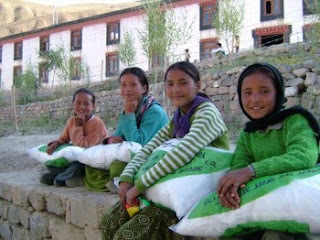 Often times the organisation distributes about 4,000 bedkits per project. After seeing all the people involved just at the school with the distribution one realises the amount of work behind it all. - Lama Tashi has been our main contact at the school and we first got in touch almost a year ago, Clarence tells me. He and Principal Tsering Dorje have been most helpful with the work on location, Clarence finishes. That the new beds are welcome is perfectly clear when talking to the students and Lama Tashi is also very happy when we meet him. He underlines the importance of getting these new beds and bed linen for the kids. Something we volunteers can agree with after visiting the sleeping quarters and seeing their old beds. - Now we will see to it that we be finished with our new student dormitory in September, before snowfall, Lama Tashi tells us and smiles when we ask him what the next important project at the school is.